Thanks to Siri on the iPhone 4S, people are quickly getting used to hearing gadgets talk. Your Mac can talk, too. For using your Mac everyday, there’s VoiceOver, which is designed for people who are blind or have low vision. If that’s more talking from your Mac than you need, you can use the Mac’s Text to Speech feature, where the Mac reads selected text. It can be handy to use in a presentation, or, if you use an app to record your Mac’s audio, you can create sound clips to use in videos or audio recordings. The default voice that your Mac uses for Text to Speech actually has a name: Alex. He has a pleasing tone and a certain warmth, but you have other choices if you're looking for something else. There’s Victoria, who’s the female equivalent of Alex; and Bruce and Katy, who are more robotic. Lion and Snow Leopard show a total of six voices available, but there are plenty more to choose from. In this how-to, you will learn how to change the system voice, as well as add new voices. 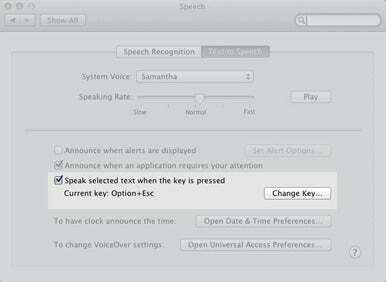 Activating the Text to Speech key combination in Lion. 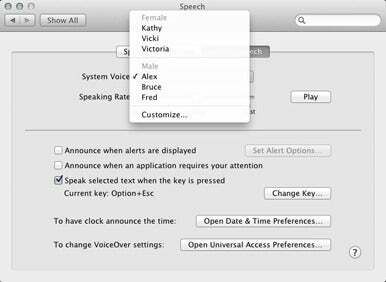 To have your Mac read selected text out loud, go to System Preferences and open Speech; then under the Text to Speech tab, check the box for Speak Selected Text When the Key is Pressed. The default key combination in Lion is Option+Esc, but you can change it by clicking the Change Key button. In Snow Leopard, you have to define a key combination. Now whenever you want the Mac to read something out loud, you just select the text and press the key combo. You can, for example, have your Mac read an email as you settle in after arriving to work. The six default voices as they appear in Lion. Snow Leopard has the same six defaults. Sure, Alex sounds like a nice guy, but he won’t be offended if you want a change. Still in the Text to Speech tab of the Speech system preference, click on the System Voice pop-up menu. You’ll see the voices, divided by gender. (In Lion, the female voices are listed first. In Snow Leopard, the male voices are first.) To see what each one sounds like, select it, and then click the Play button. You can use the slider bar to adjust the Speaking Rate. If you like one of the six voices, select it, adjust the Speaking Rate (if you want), close the window, and you’re done. If you aren’t satisfied with one of the six, you can add more voices. In the System Voice pop-up menu used in step 2, select Customize (or Show More Voices if you’re using Snow Leopard) at the bottom of the menu. In Lion, a new window will appear, with a list of different voices. Many are designed for use with a particular language, such as German, Japanese, Arabic, Korean, or even South African English, and those voices will read American English with the inflections of the language it is designed for. To sample a voice, check its box and click on the Play button. Check the boxes of the voices you want, and then click OK. The OS will need to download the voice, so you’ll be asked to confirm that you want to install it. If you click Install in the confirmation window, the Apple Licensing Agreement will appear. You’ll need to agree to it to proceed. The complete list of voices available in Snow Leopard. In Snow Leopard, after you select Show More Voices, you need to open the System Voice pop-up menu again. You’ll notice that the list has expanded. To sample a voice, you need to select it, and then click on the Play button in the Text to Speech tab of the Speech preference. Unfortunately, you don’t get the language choices that are available in Lion. Lion users: If you want a Siri-like voice on your Mac, install Samantha, located in the English (United States) Female section. Samantha doesn’t sound exactly like Siri, but it’s close. If you adjust the speaking rate, you can get closer to a Siri sound-alike. Snow Leopard doesn't have Samantha or another Siri-like voice. Once you’re done adding new voices and you’ve found one you like, select it, adjust the Speaking Rate if you want, and then close the Speech preference window. You’re done.